NEWTON, MA--(Marketwire - June 4, 2007) - Railpass.com today announced that it added the ability to book Australian rail passes and tickets, New Zealand rail passes and tickets and select North American rail passes. Railpass.com is now the first and only major online rail travel booking site to offer consumers international destinations beyond Europe. "This is only the beginning of our mission to make rail travel around the world highly accessible to North American consumers," said Mike Fuller, president and co-founder of Wandrian, the developer of Railpass.com. "In the past, booking rail abroad has been complex, and many times absolutely impossible, until you arrive on-site in a foreign country. Your trip will be better if you plan and book in advance, no matter where you are traveling. We plan to offer rail options in more continents and countries in the coming year." Railpass.com now offers the following passes for North American travelers. Go to the Rail Australia Passes page for more information and pricing. designated time frame -- either 15 or 22 days within a 6 month period. travel on all GSR routes. Countrylink train services and connecting Countrylink coaches. accommodations, site-seeing, and fabulous cuisine. 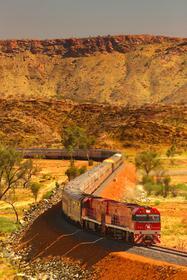 XPLORER, the Ghan, the Indian Pacific and more. Railpass.com now offers the following passes for North American travelers. Go to the New Zealand Passes page for more information and pricing. Interislander ferry crossing between the North and South Islands. and a train journey on either the Tranz Coastal or the Tranz Alpine. *InterCity and Newmans Coach Lines operate 130 services a day stopping at more than 600 towns and cities across New Zealand. The Travelpass is valid for 12 months from the date of activation and travel days do not need to be consecutive. Railpass.com also offers the North American Pass. Take an unlimited number of trips on practically any Amtrak train in the United States and any VIA Rail train in Canada. Amtrak is the leading rail operator in the USA, providing intercity passenger rail services to over 500 destinations in 46 states on a 22,000-mile route system. VIA Rail operates trains in all regions of Canada over a network spanning from the Atlantic to the Pacific, and from the Great Lakes to Hudson Bay. The North American Rail Pass is valid for 30 consecutive days travel across the USA and Canada, granting direct access to over 900 cities and communities in the USA and Canada. Go to the Tickets page for more information and pricing. Railpass.com is the largest single rail pass outlet in the US. It is a division of Wandrian, Inc. and the official agent for various leading railways, rail providers and distributors such as Eurail, BritRail, Trenitalia (Italian State Railways), Amtrak, Rail Australia, and SNBC (Belgian Railways). Wandrian is a leading global travel distributor and technology developer for rail products and services that provides consumers and travel agents with a cost-effective, easy-to-use site for booking global rail. The company provides its services to international rail travel sites, including Railpass.com, InternationalRail.com and Italiarail.com. Wandrian is based in Newton, MA and has offices in White Plains, NY, United Kingdom, and Australia. The Company was founded in 2000, and is funded by Brook Venture Partners and Boston Capital Ventures. Wandrian and Railpass.com are properties of Wandrian, Inc. All other products and services mentioned are properties of their respective owners.